That’s why we created this list of 23 awesome ways to work your biceps. Some of these are classics; some are new. Some are a grind; some are fun. Pick the ones you like (and maybe some that you don’t), and use them to pump up your arms—and fill out your sleeves. In a list like this, you can’t leave out the classic curl. So we didn’t. (Don’t worry: The exercises will get more interesting.) But would ask that you use a weight that makes sense: If you’re swaying back wildly and contorting your body—especially excessively arching your lower back—to lift the load, you should probably get a lighter pair of dumbbells. Do it: Grab a pair of dumbbells and let them hang at arm’s length next to your sides. Turn your arms so your palms face forward. 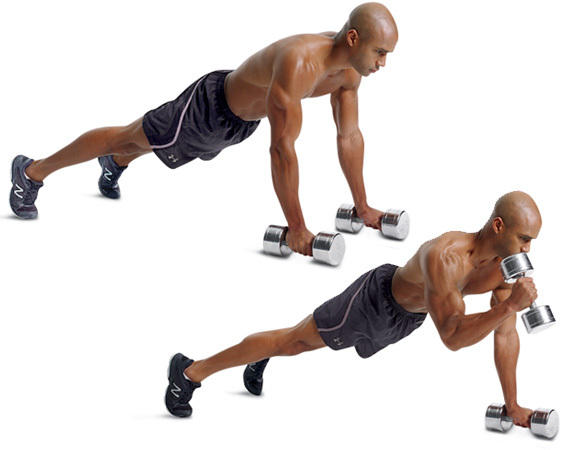 Without moving your upper arms, bend your elbows and curl the dumbbells as close to your shoulders as you can. Pause, then slowly lower the weight back to the starting position. Each time you return to the starting position, completely straighten your arms. It’s nearly identical to the standard-grip biceps curl, with one important twist: Your palm is not centered on the bar of the dumbbell. 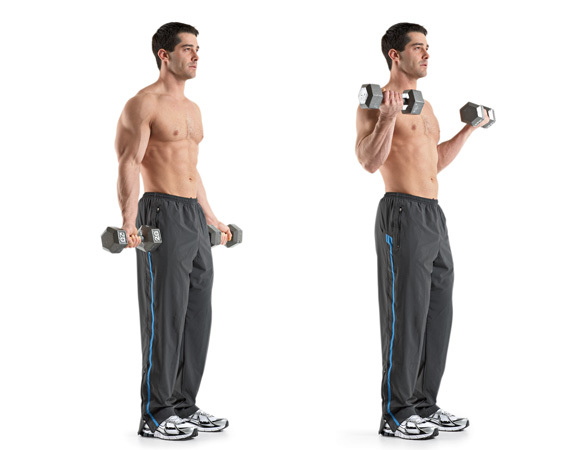 Holding the dumbbell close to one of the heads shifts the weight distribution. It challenges your biceps brachii to work harder to keep your palms facing forward at all points of the exercise. Do it: Grab a pair of dumbbells and let them hang at arm’s length next to your sides—either your thumbs or pinkies should rest right next to one of the heads of your dumbbells. Without moving your upper arms, bend your elbows and curl the dumbbells as close to your shoulders as you can. Pause, then slowly lower the weight back to the starting position. Each time you return to the starting position, completely straighten your arms. Take your standard-grip curl and flip it on its side. This small difference in the way you hold the dumbbell helps transfer more of the work from your biceps brachii to your brachialis—a muscle that can make your arms look thicker. Do it: Grab a pair of dumbbells and let them hang at arm’s length next to your sides with your palms facing your thighs. Without moving your upper arms, bend your elbows and curl the dumbbells as close to your shoulders as you can. Pause, then slowly lower the weight back to the starting position. Each time you return to the starting position, completely straighten your arms. >>>FREE daily workouts. Sign up here! 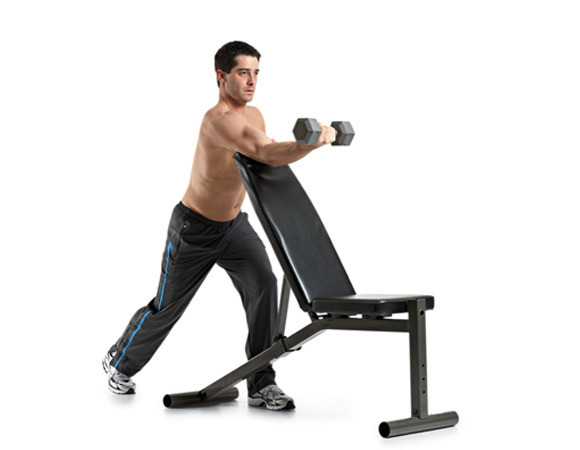 This exercise takes advantage of isometric training, a technique in which you hold the weight in one position for a period of time. It will stimulate your muscles in a way that is different from performing full reps, explains BJ Gaddour, C.S.C.S. creator of the Lose Your Spare Tire Exercise Program. And that simple change can spur new growth. 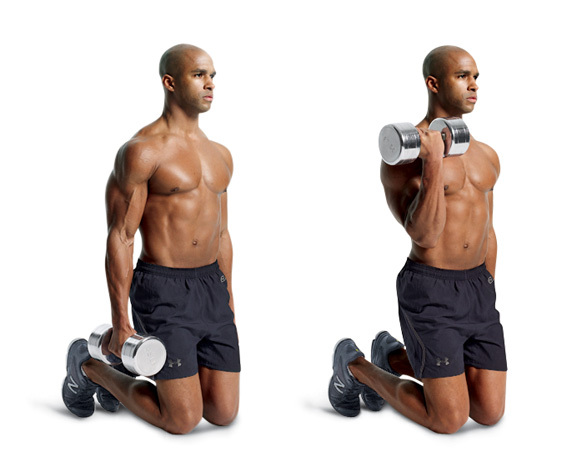 Do it: Grab a dumbbell with your right hand and stand behind a bench raised to a 45-degree angle. Lower the dumbbell until it’s just beyond half way. Hold for 20 seconds and then repeat on your left arm. Lying chest-down on a bench really isolates the biceps since you don’t have to maintain as much tension in your legs and core muscles as you do when you stand. Use various grips in this position to zero in on different parts of your biceps. 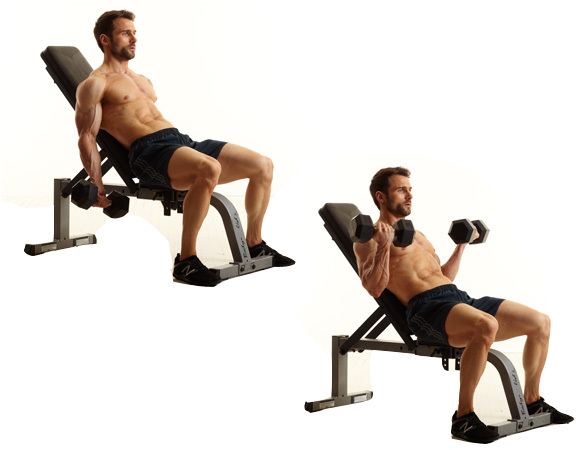 Do it: Grab a pair of dumbbells and lie with your chest against a bench that’s set to a 45-degree incline. 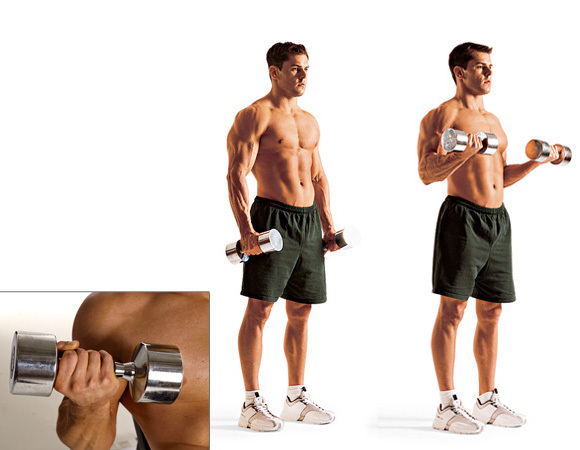 Without moving your upper arms, bend your elbows and curl the dumbbells as close to your shoulders as you can. Pause, then slowly lower the weight back to the starting position. Each time you return to the starting position, completely straighten your arms. The opposite of the decline variation, you’ll lie on your back, allowing your arms to drop down behind your body. 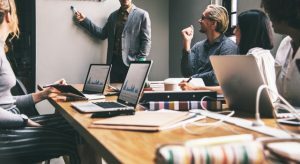 This puts an extra challenge on the long head of your biceps brachii because you’re working from a deficit—meaning, you’re starting the movement at a point where you have less leverage than normal. Do it: Grab a pair of dumbbells and lie with your back against a bench that’s set to a 45-degree incline. Without moving your upper arms, bend your elbows and curl the dumbbells as close to your shoulders as you can. Pause, then slowly lower the weight back to the starting position. Each time you return to the starting position, completely straighten your arms. Curling a weight with one arm helps you zero in on weak spots—especially if you have one side that’s stronger than the other, says Gaddour. And performing the move in a kneeling position will diminish the chance that you use body English to heave the weight up to the top position. Do it: Grab a pair of dumbbells. Hold one dumbbell by your side in your left hand, palm facing your thigh. In your right hand, hold the dumbbell with your palm facing outward. Without moving your upper arm, bend your elbow and curl the dumbbell as close to your shoulder as you can. Pause, then slowly lower the weight back to the starting position. Each time you return to the starting position, completely straighten your arm. Perform all reps on your right arm before switching to your left. This exercise targets the three major muscles that make up the biceps—the biceps brachii, brachialis, and brachioradialis—by rotating from an underhand to an overhand grip halfway through the move. Do it: Grab a pair of dumbbells and let them hang at arm’s length next to your sides. Turn your arms so your palms face forward. 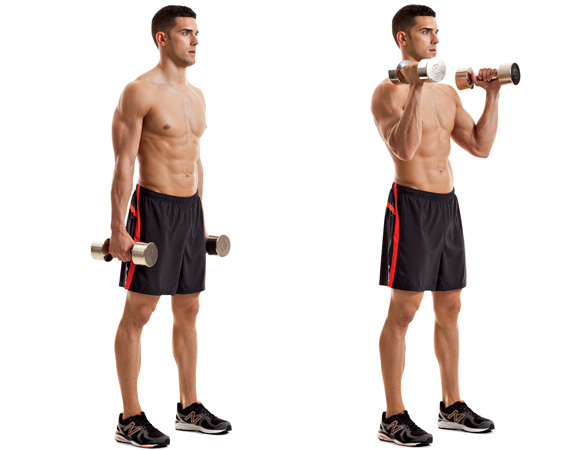 Without moving your upper arms, bend your elbows and curl the dumbbells as close to your shoulders as you can. Pause, then rotate the dumbbells so your palms face forward again. Slowly lower the weights down in that position. 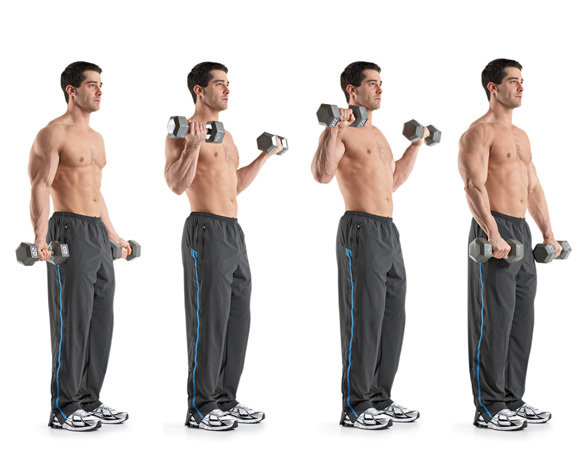 Rotate the dumbbells back to the starting position and repeat. Just like the dumbbell hammer curl, this exercise will hit your brachialis to build thickness in your arms. But unlike the dumbbell version, the cable machine keeps a more steady and constant load on the biceps for longer, which may elicit more growth, according to Brad Schoenfeld, Ph.D.
Do it: Hold both ends of a rope attached to the low pulley of a cable machine. Press your elbows into your sides with your palms facing each other. Keep your feet shoulder-width apart, your torso upright, and your knees slightly bent. 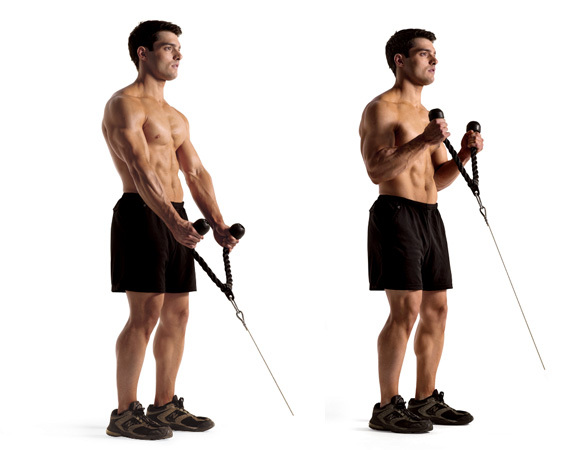 Keeping your arms stable throughout the move, curl, the rope toward your shoulders, Pause, and reverse the movement to return to the starting position. Instead of holding your arms by your sides for this variation of the curl, you’ll keep them extended outwards, parallel to the floor. Just holding your arms in this position will put them to work. Adding a curl helps zero in directly on your biceps. Do it: Stand between the weight stacks of a cable crossover station and grab a high-pulley handle in each hand. Hold your arms out to the sides so they’re parallel to the floor. Without moving your right arm, curl your left hand toward your head. Slowly allow your left arm to straight and then repeat the move with your right arm. Resting your arms on a sloping pad of a preacher bench helps isolate your biceps by taking your other upper-body muscles out of the equation—meaning, they won’t come into play to assist where your biceps are weakest. If you don’t have the appropriate workstation, you can use a Swiss ball or a bench angled to 45 degrees. Do it: Grab an EZ-bar with your hands six inches apart. Rest your upper arms on the sloping pad of a preacher bench and hold the bar in front of you with your elbows slightly bent. Without moving your upper arms, bend your elbows and curl the bar toward your shoulders. Pause, then slowly lower the weight back to the starting position. While the chinup doesn’t isolate your biceps, it certainly trains them hard. Along with other muscles in your arms, shoulders, and back, you’ll use your biceps to pull your entire bodyweight from a dead hang, building serious upper-body strength, according to Tony Gentilcore, C.S.C.S., co-owner of Cressey Performance in Hudson, Massachusetts. 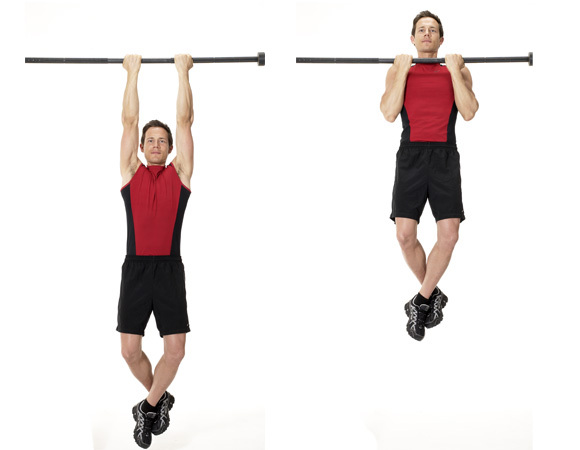 Do it: Grab a chinup bar using a shoulder-width underhand grip and hang at arm’s length. 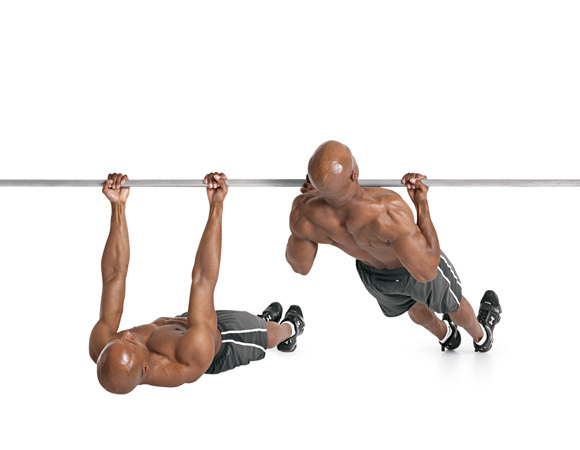 Squeeze your shoulder blades down and back, bend your elbows, and pull the top of your chest to the bar. Pause, and slowly lower your body back to the starting position. This is especially useful if you—like many men—can’t crank out rep after rep of the full chinup. Since your muscles can handle more weight lowering an object than they can lifting it, you can perform more muscle-building reps of the lowering—or negative—portion of the movement. The bonus: Lowering actually causes more muscle damage than lifting, which leads to larger guns. Do it: Stand under a chinup bar on a box or bench. 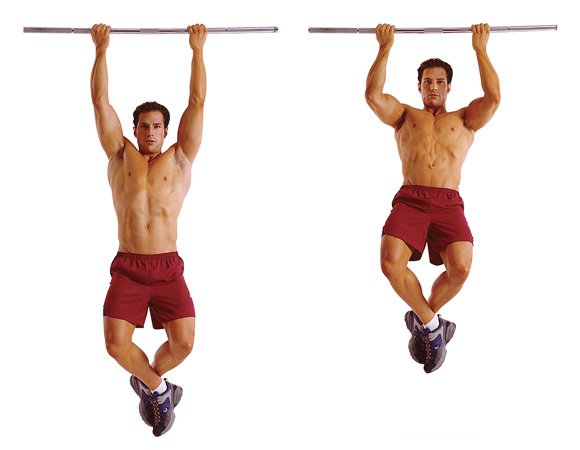 Jump up and grab the bar so your chest is even with your hands. Slowly lower your body over the course of 3 to 5 seconds by extending your elbows until your feet reach the box or bench. Pause and repeat. If you can crank out rep after rep of the chinup and want a bigger challenge, add an isometric hold to the middle of each rep. Doing so will diminish your momentum, according to Gaddour. And since it’s harder to start from a dead stop than it is to keep going, each rep will be harder even though you didn’t add any weight, he says. Do it: Perform a chinup and then slowly lower halfway down so your arms are at a 90-degree angle. Pause for a second or two before pulling your chest to the bar again. Pause, now lower all the way down so your arms are straight. 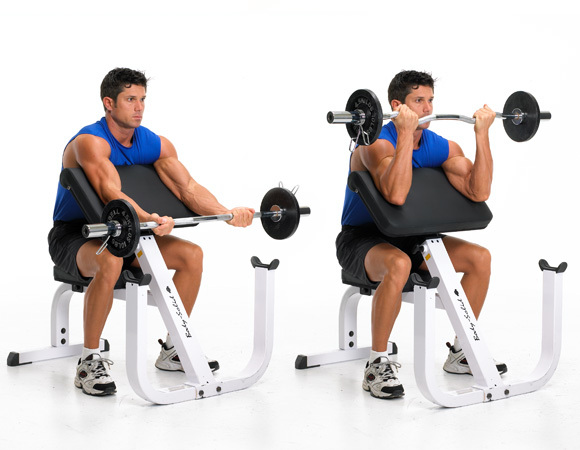 When you sit and row instead of stand and row, your biceps are in the direct line of the pull so they work extra hard during each rep, according to Gentilcore. 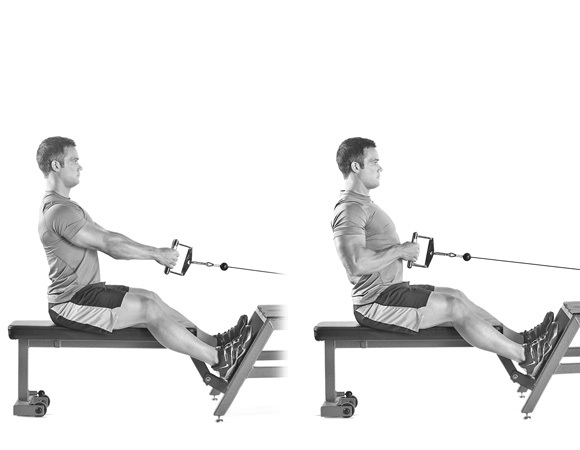 The seated cable row will also help you build a massive back to compliment your guns. Do it: Sit at a seated cable row station with your feet on the platform and your knees slightly bent. Grasp a V-bar with your palms facing each other. Keep your back flat and pull your shoulders back as you pull the bar toward your torso. The muscles in your upper body have two functions: push and pull. Your biceps are most active when you pull, according to Alwyn Cosgrove, a Men’s Health Fitness Advisor. Since you’re using other muscles to perform the row, you’ll likely use a weight that’s much heavier than one you would curl. Do it: Grab a barbell with your hands just beyond shoulder-width apart and hold it at arm’s length. Bend at your hips and knees, bracing your abs as if you’re about to be punched in the gut. Pull the bar to your ribcage, pause, and then lower back to the starting position. While the hammer curl hits your biceps, the instability of lifting a limb off of the floor while holding a plank will make this an ab burner, too, says Gaddour. Do it: Grab a pair of dumbbells and assume a pushup position with your palms facing each other. 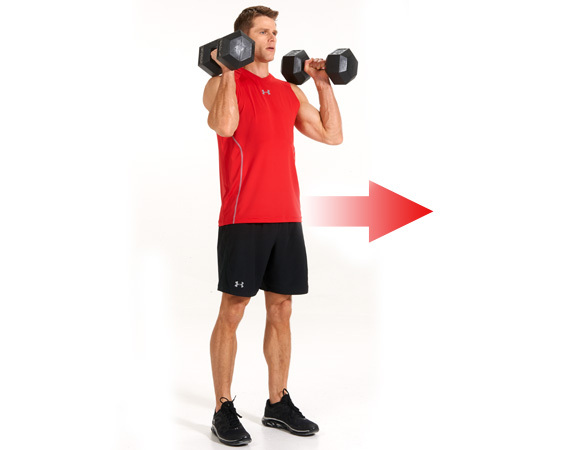 Without moving your upper arm, curl the weight in your right hand toward your right shoulder. Lower it and repeat with your left arm. Alternate arms with each rep for 30 to 60 seconds. A continuous-loop resistance band might not look as intimidating as iron, but it will pack a punch to your biceps. Jumping your feet out will help to shorten the band, increasing the resistance when you pull up for the curl, explains Gaddour. Additionally, the fast-paced nature of this move will help hammer your muscles in a way you don’t get with slow and steady curls. Do it: Stand with your feet together and centered on a continuous-loop resistance band. Hold the top of the band with your palms facing each other. 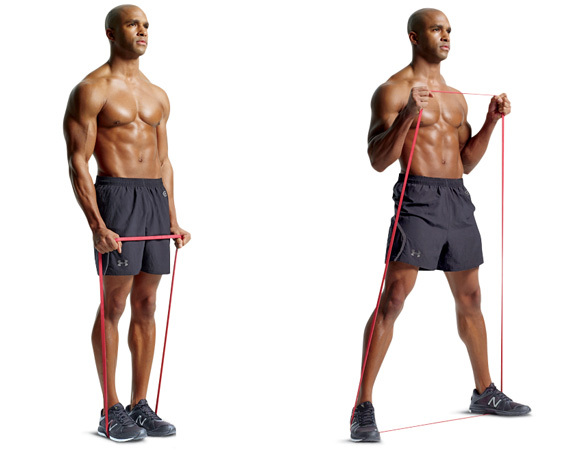 Jump your feet out and curl the band toward your shoulders, simultaneously. Without pausing, reverse the movement to return to the starting position. Perform continuous reps for 20 seconds. This move will hammer your biceps while you work the larger, energy-hungry muscles of your lower body. It will help you burn calories to reveal your chiseled arms. 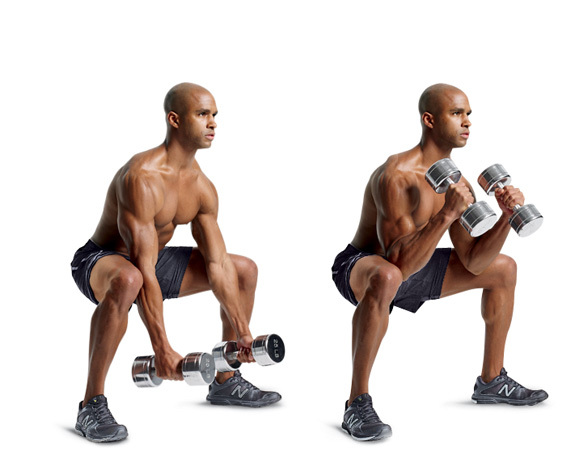 Do it: Grab a pair of light dumbbells and stand with your feet shoulder-width apart. Push your hips back and squat until your thighs are parallel to the floor. Keeping your weight on your heels, your elbows pressed against your inner thighs, and your palms facing each other, curl and lower the weights for 30 to 60 seconds. 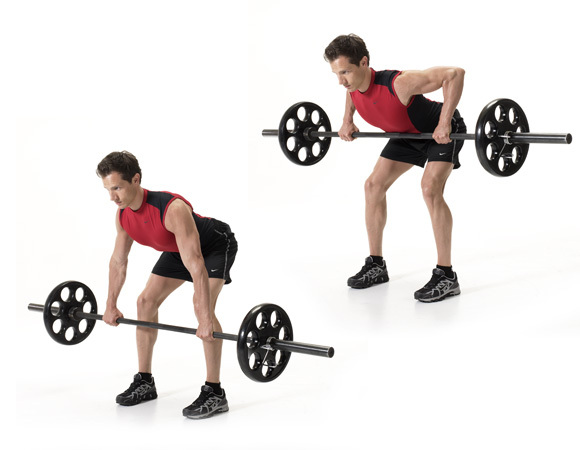 The farmer’s carry is a great way to work your body from head to toe as you walk, but holding the weights in a racked position can help you zero in on your biceps. It’s like an isometric hold for your guns, jostling the weight with every step. And since you typically use extra-heavy weight for farmer’s carries, you’ll overload your biceps in a completely contracted position. Do it: Grab a pair of dumbbells and hold them in the racked position so one head of each dumbbell rests by your shoulders. Walk forward for 10 yards, turn around and walk back. Muscles grow through a combination of load and time under tension. By starting each rep with the weights at your sides and then lifting them to your shoulders, you effectively double the amount of time your biceps spend working. Do it: Hold a pair of dumbbells at arm’s length, your palms facing each other. Bend your hips and knees so that the dumbbells hang at knee level. 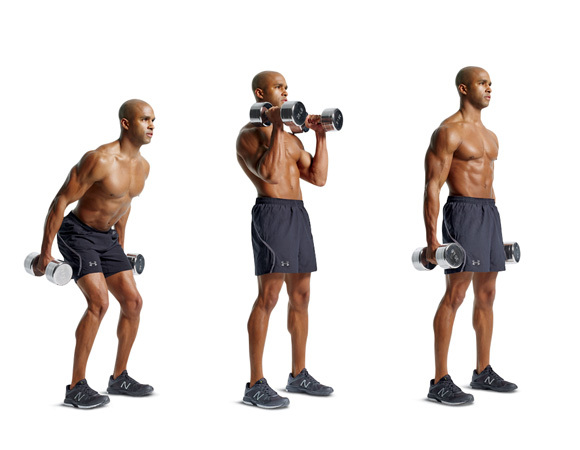 In one move, explosively pull the dumbbells upward as you thrust your hips forward; then “catch” the dumbbells at shoulder height. Stand tall, and then return to the starting position. Make sure to use a manageable weight: 35- to 50-pound dumbbells are about right for most guys. 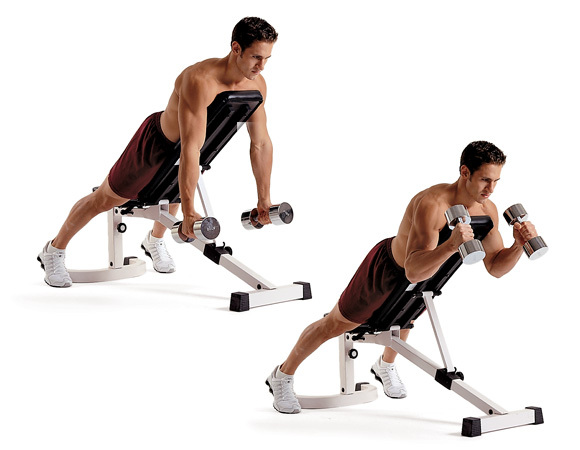 The inverted row is primarily an upper-back exercise. However, using an underhand grip instead of a standard grip forces your biceps to work harder. 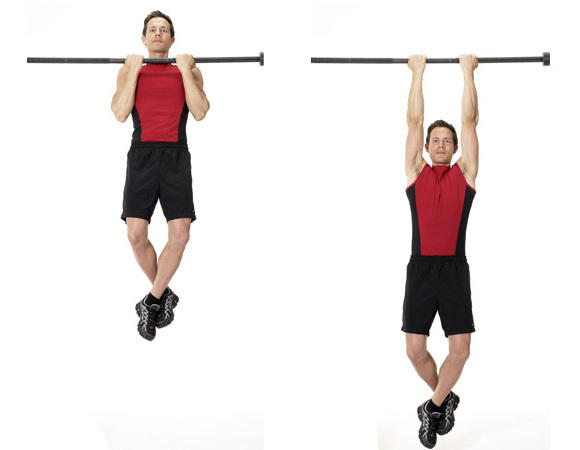 Do it: Grab a bar with an underhand, shoulder-width grip. You palms should be facing you. Hang with your arms completely straight. Your body should form a straight line from your ankles to your head. Initiate the movement by pulling your shoulder blades back, then continue the pull with your arms to lift your chest to the bar. Pause, then slowly lower your body back to the starting position. >>>Get a FREE workout emailed to you daily! >>>Unlock your T! Learn how!